LIMA -- State-owned Perupetro signed on Thursday 13 contracts valued at $650 million with foreign companies for the exploration and exploitation of hydrocarbons in Peru. 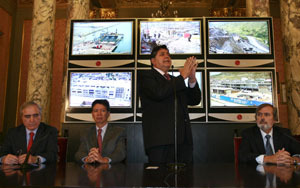 "With these 13 contracts we now have in effect a total of 92 oil contracts," a situation that shows "the confidence" that investors have in Peru, President Alan Garcia said during a ceremony at Government Palace in Lima. For his part, Energy and Mines Minister Pedro Sanchez expressed a belief that Peru will soon be an oil exporter. A consortium made up of the Argentine Pluspetrol, India's Reliance, China's CNPC and the Peruvian company Petroperu will work Block 155 in southern Peru. The consortium made up of Peru's Consultora de Petroleo S.A. and the South Korean Kedcom Co. was awarded the exploration of Block 160, while the Canadian firm Talisman and Colombia's Ecopetrol were awarded Block 158, both located in the central jungle area. For its part, the Spanish firm Cepsa obtained Block 130 in the northern jungle, while Colombia's Grupo Petrolero Suramericano won Block 156 in the southern mountains. The representative of the contracting companies, Cepsa executive Fernando Maravalla, said that "the opportunities this country offers in the midst of the world economic crisis and the response of the companies present are a clear acknowledgment of the legal and financial stability that Peru offers the world." He also promised the "maximum respect for the care of the environment and seeking always a sustainable development" in the work of exploration to be carried out in the Andean country. According to conditions established in the contracts, the companies will execute the perforation of 35 oil wells during the exploration phase, Perupetro said in a statement.